It took us more than a few Instagram messages and a few texts to friends to understand what Wolf did. Were they designers? Were they artists? Were they event planners? We were rightfully baffled because the duo do something that nobody else does, curate exhibitions where art and design and retail intersect. 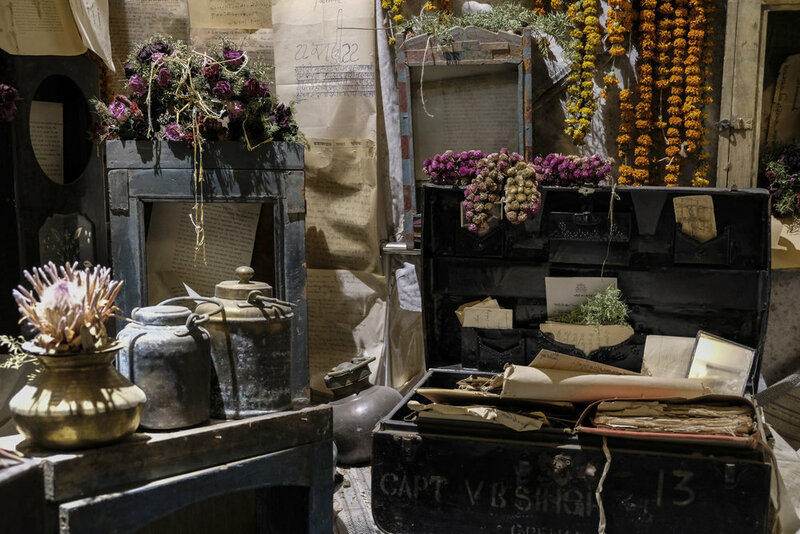 Founded (formally) by self taught artists Ritu and Surya Singh in 2014, Wolf create whimsical, story-driven, 'experiential shows' where they display their own creations - installations made from discarded objects and reclaimed scrap material as well as the work of other artists and designers. Their current show Theatre of Stories, on now until the end of February, was launched to coincide with the Jaipur literature festival and is inspired by the literary works of Marcel Proust as a result, prompting the viewer to 'see with new eyes'. Their sixth show since 2015, this time around they've invited Jaipur resident Nur Kakouji's Kuwaiti lifestyle label Ecru, block printing maven Brigitte Singh, photographers Nicolas Henry and Floriane de Lassée as well as Bombay home store Baro and Surat-based design house Shed whose furniture and toys encourage visitors to linger. We spent a morning at Clarks Amer learning everything we could about Wolf. Tell me about the two of you and what life before Wolf looked like? We are both outsider artists, not trained but following the heart. We were put on this journey fifteen years ago when we were starting to furnish our place, The Farm, a homestay on the outskirts of Jaipur. We opened stores full of salvaged stuff from our ancestral palace. The government was to build a dam and our lands came in the catchment area. Here the journey began, of the reuse, recycle, repurpose. We started The Farm in 2008 describing it as an eclectic art hotel. It was quite literally our playground so we made the usual, chairs, tables, etc, repurposing the doors and windows. We also made large scale trees and insects and pushed the boundaries with the freedom we had. There was not a name then but there was the path. What a story. What do you mean by stores? Surya’s father had these stores made to keep all the stuff being taken out of his palace. Everything that could be removed was taken, doors, windows, beams, railings, gates, and all the things in stores of the palace had to be put into new stores with huge tents, large utensils, lots and lots of papers, all the account books, it really was Aladdin’s cave when we first started to look into the stores. Some were made in Banswara, where the government had relocated the entire village and others were constructed at the farm, a property which was already with the family then. When the farm was being worked on as a homestay, we decided to use all the things in the stores but to find new context for them. Like the girders (yes, Surya’s father even got girders out from the palace) became the trunks of the trees we made at the farm, the door became tables, etc, of course salvaged, it would have definitely drowned otherwise! "We have become discard collectors!" Tell me about the beginnings of Wolf. Wolf started because of the encouragement from our patrons Timmie and Apurv Kumar who commissioned various pieces for the hotel and their home. It had been an idea that got grounding from the Clarks. We knew that we didn’t want to just start a practice but a movement, and the support we have received from them is unparalleled. How do you describe what Wolf does now? Wolf is a platform to collaborate with the tribe: individuals who enjoy time for themselves, who steer clear of ‘fast’ or ‘many’ or ‘same’ and who are driven by passion and not materialism, it is a movement towards a more conscious, sustainable and morally sound environment so that we can leave a better world. It is about finding opportunities for the talented and promoting them through a network. It is about being resourceful, hard working, trustworthy and looking out for the pack! Tell us about this show Theatre of Stories. What is “seeing with new eyes” and who are your collaborators? Theatre of Stories is inspired by Marcel Proust who considered art to be the most important thing in life as through it you can see the same thing over and over again but with “new eyes”. We have six creatives whose works we put out and each of them fit into the ‘Proustian’ story, from Brigitte Singh who displayed 23 patchwork masterpieces. Proust was all about memory and nostalgia and this was such a beautiful way to encapsulate that. It was like an archival display of her prints over the years, starting with a patchwork with her earliest prints to a fantastic pattern with the poppy that is up at the Victoria and Albert museum. Shed who took us back to our earliest childhood memories with celebrating the spinning tops. It is so wonderful to see people from an older generation stuck on that table of hers, revisiting their childhoods with the top if not the madeline! Ecru draws parallels between Proust and 1001 Arabian nights through her memory tent. Nicolas Henry who took us on his oriental fairytale definitely encouraging you to see with new eyes at many many levels. Floriane de Lassée with the series on the trucks during harvest season was the same! Baro brings in the best seats to see and hear the stories, made from reclaimed teak and focused on ergonomics, a term alien to most people making furniture in India. And then there is our work. brings together people who share headspace." Do you see this as exhibition design or something else? We don’t call it exhibition design. We call it a collaborative experiential show which brings together people who share headspace. It is unique in its structure and motive in the sense that we don’t know anybody else who is doing something like this. We think of the story and then work our installation around it and then invite the others to come in with their colours and vibes. That by itself the installation works, but it's another joy to bring together people of the same spirits and include them in it. How do the collaborators fit in? These shows are a way for us to put out our art but in a different manner. The idea was that when it’s shopping, you tap into a whole different and wide segment of people who would not necessarily go to a gallery but when they came to our show were definitely affected by the arts and artistry. Also, the retail helped us to fund all the madness, the installations, the music, the vibe and feel! The initial two saw a lot more people retailing and the arts were more generic but the way now is more focused on a story and all the ones who are in are either a part of the tribe or just fit the story perfectly. Where do you collect your scraps now? We have become discard collectors! We collect when we find and then it’s kept at the farm till it finds its spot somewhere, like the clock boxes for this one, we had been collecting these discarded clock boxes for the last 5-6 years and then they found their spot. The room in the centre is full of broken or discarded clock boxes from the 60s, 70s, 80s, 'in search of lost time', the translation of Proust’s book to English. What is a typical day like for you when you’re not exhibiting? You need time to dream, so Surya takes holidays very seriously. He is also the constant gardener and spends time planning that. We do a lot of work with our hands and using the workforce at the farm - the cook, the gardeners, the driver but there isn’t a plan for it. The odd commissioned piece is always being worked on and now there are two shows to be planned, one for Bombay with Baro and the other during the lit fest. Lots of friends come and drop their kabaad with us saying “Can you do something with it?” so there is always something to do but we make sure there is time taken out to do nothing. What are the best things about living in Jaipur? Jaipur is such a beautiful, inspirational city where all kinds of arts and crafts live within the labyrinth of the old city, generations of people living art and craft! And then there is the modern and new living beside it, making it contemporary. Our favourite place is definitely the old city, all of its bylanes, old structures, and the people too who seem to live in another timezone! We hope this movement of ours brings about the change in the moral fabric that seems to be disintegrating, brings about consciousness about waste/scrap/discards and we really hope we can leave it better for our children. "There is always something to do but we make sure there is time taken out to do nothing." Theatre of Stories is on until 28th Feb, 2018. More details on our events page. Visit Wolf online and follow them on instagram.